While not entirely missing in action, progressive rock band Magellan has been flying under the radar for some time. Founded by brothers Trent and Wayne Gardner, they band hasn't produced a full-length album in eight years. Yet over the past several years, Magellan has released some single including covers of Kansas' Dust In The Wind and Chicago's iconic song 25 to 6 to 4. A few months back, they offered a new single, Icons, to digital retailers. You listen to the video below. The Magellan camp has also experienced some tragedy in the last years. Brother Wayne took his own life in 2014. Yet, despite the spotty output and family grief, there is some cause for celebration. Magna Carta has revived the now long out of print first to albums, Hour Of Restoration and Impending Ascension, in a Double Feature presentation. The former album was also the first release for the then fledgling label. Essentially, Magellan and these two releases represent some seminal American neo-progressive rock which also moved the band into the so-called "third wave" of the genre. These reasons alone are enough to persuade you to buy this compilation. Boiling it down, with brother Trent doing all the lyrics, songwriting, and playing keyboards, the Magellan sound is heavily keyboard oriented. The guitars seem there for accent and rhythm mostly. Having listened to these albums several times, I can't recall a memorable guitar solo. After this, you'll find the lyrics intelligent and cogent, sometimes venturing into historical concepts, like Magna Carta, about the historic English document, from the first album. As to that song, it had to be my least favorite song across both albums. Long and lumbering, it also finds Trent Gardner getting a little to scattered and screamo in his vocals. Better songs include Estadium Nacional, Waterfront Weirdos from the second, and Union Jack and Friends of American from the first. Ultimately, if I could describe Magellan's sound, they remind me of a mash up of late Seventies Yes and Kansas, maybe with a slight nod to Genesis and ELP. If you're a prog rock geek, or someone who simply loves the genre for it's variety, creativity, and musicianship, you should certainly buy Magellan's Double Feature. 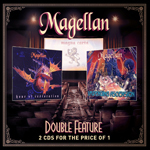 If you're a prog rock geek, or someone who simply loves the genre for it's variety, creativity, and musicianship, you should certainly buy Magellan's Double Feature, offering their first two albums Hour Of Restoration and Impending Ascension.